Dale Dixon ... "Just managed to get home and catch the last flowers of this beauty. I like the way the flowers change colour as they age." 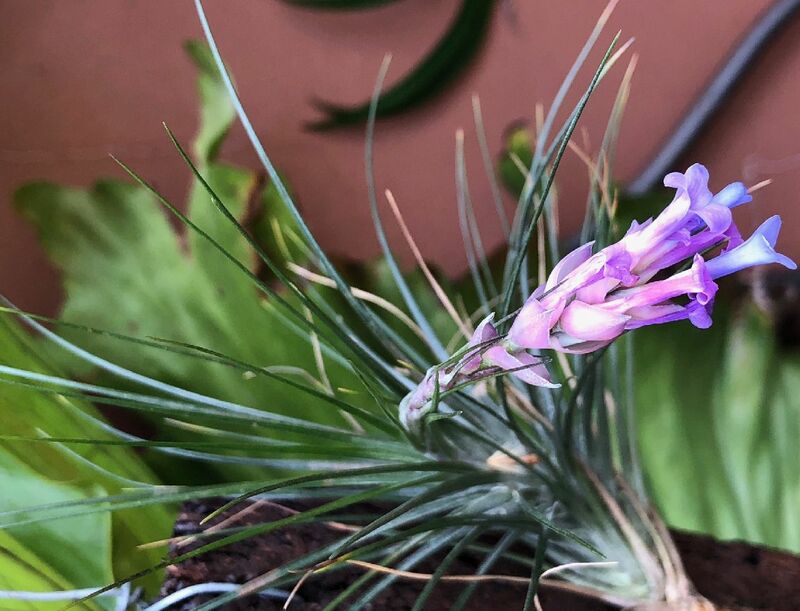 Lloyd Godman ... "My plant is nearly in flower. It grows new pups to flowering in one year." Rob Bower ... "Yes the pale blue is lovely. Mine didn't like the hot dry conditions last summer at all and are quite slow growing - maybe a cool climate plant?" Ray Clark ... "Must be the right time of year, my T. montana in the last stages of flowering. Yesterday’s heat was enough." Chris Larson ... "This is mine taken last week – ex- Isley. Many of these were spread around by Collectors Corner & Maurice Kellett after 2006 import. I put the description of seideliana here in case anyone wants to compare." Derek Butcher ... "Yes everybody seems to have T. montana but is it T. montana? 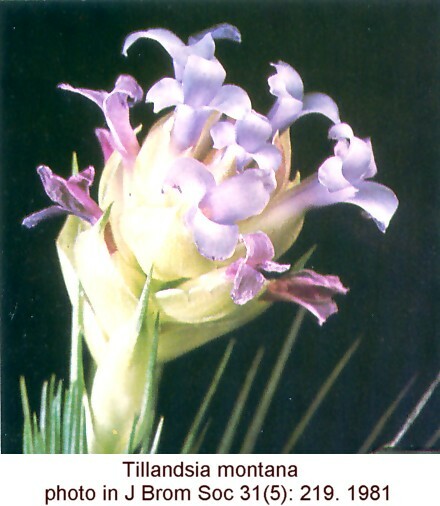 In 1962 Reitz described T. montana and in 1979 Pereira described T. seideliana and in 1983 Reitz said they were the same. Everybody knows T seideliana but who has checked either species with the descriptions. Which one is which? I enclose a painting for you to ponder over plus descriptions." 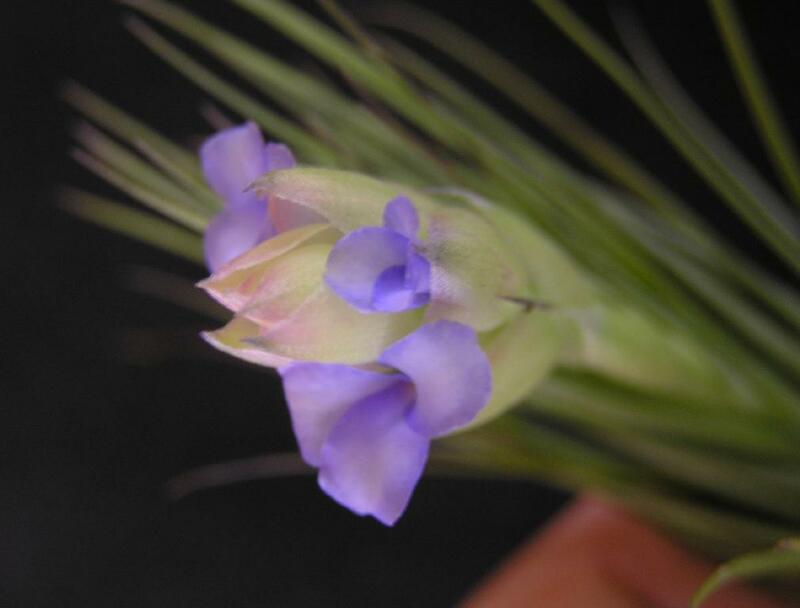 I think T.montana is a blue T. tenuifolia like plant, but with short (2-3 mm) connate adaxial sepals. 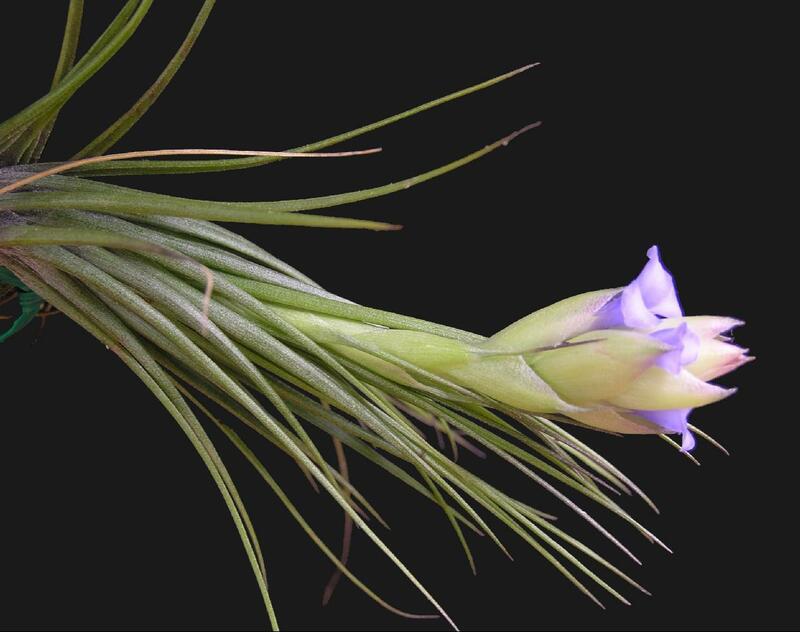 Your plant looks more like T. stricta which should have evenly short (1.5 mm) connate sepals. How different this is, I don't know. Just Butcher a flower and let me know." Chris Larson ... "Next time I have one coming to flower I’ll send it to you Derek. FYI some detail- as I could not see it below. Collectors Corner and Maurice Kellett sold a stack of these (100s), in the immediate period after importation from Rainforest Flora in 2006. Since then Collectors Corner has been propagating them vegetatively. I’d say a large proportion of what is around as T. montana in Australia originates from that import." Derek Butcher ... "Chris: The photos that Eric has in his Encyclopaedia are of a plant I got from Rainforest Flora 1n 1988. When it flowered it seemed close enough to the description but slightly different to the photo in JBS. Peter Tristram has a plant closer to the JBS photo! (see below). The volume of plants coming out of Rainforest Flora suggest seed raising was involved where slight variations can be expected. I put this in the same category as leonamiana diversity!" 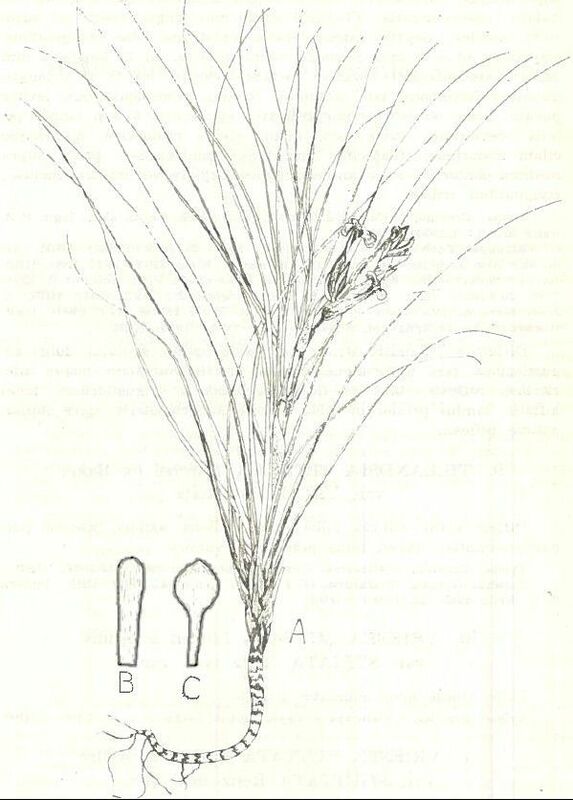 Eric Gouda ... "Looking at the protolog image (above), the drawing shows the main difference with T. stricta in having a narrow petal claw and distinct ovate blade (C) against a ligulate petal in T. stricta (B). Stick a petal on sellotape and put it on a piece of paper to show how it looks like, or is it too late?" Justin Lee ... "I have this plant. See below, plus a flower pulled apart." Derek Butcher ... "There seems to be very little difference between seideliana and montana. Most of you seem to be growing montana from Rainforest flora via Gardenworld. 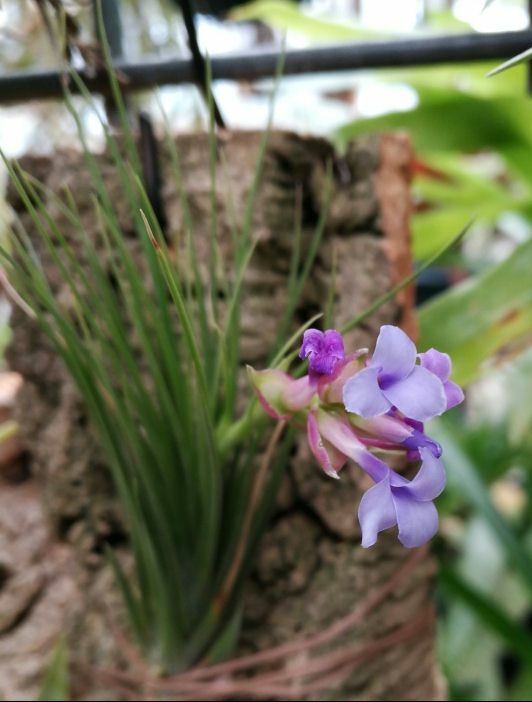 I seem to have been the only one growing seideliana from Rainforest in 1986. From Justin's dissection Eric considers that it is close to Fossari's painting of montana but not quite. To me near enough is good enough." 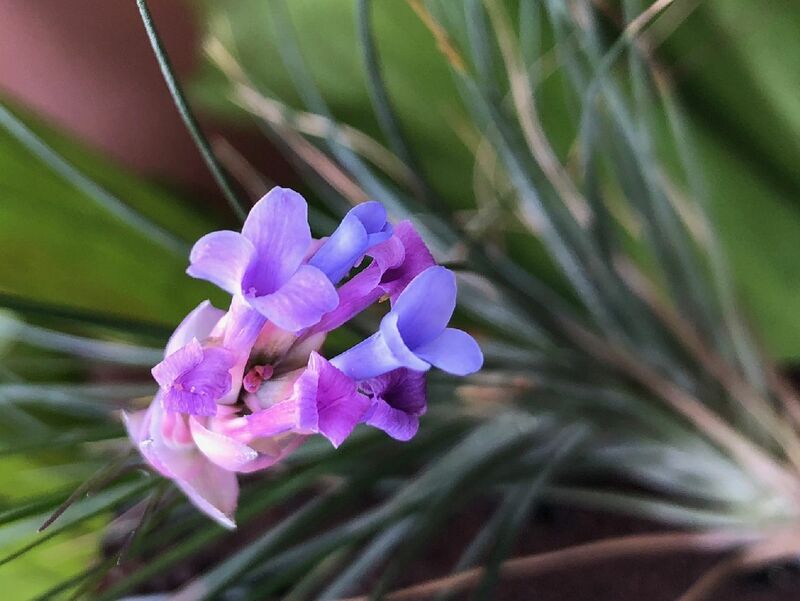 Tillandsia montana Reitz, Sellowia 14: 106, fig. 5. 1962. 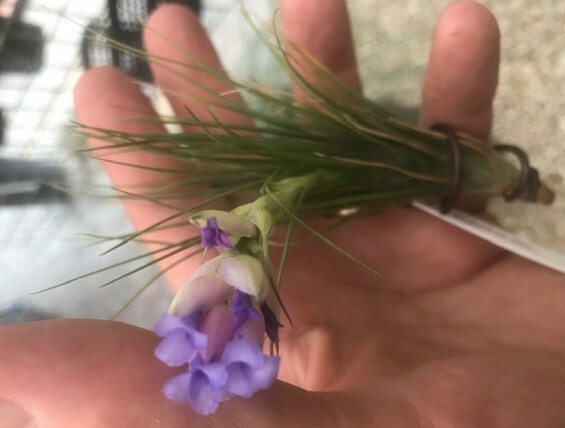 Plant caulescent, flowering 2-3 dm high. Blades linear, filiform-attenuate, 3 mm wide at base, channeled, green or dark violet, appressed-lepidote. Scape-bracts erect, imbricate, the lower foliaceous, the upper membranaceous, lepidote. Inflorescence simple, of 5-15 polystichous flowers, sub-lax, 3-4 cm long. Flowers erect or suberect, sessile. 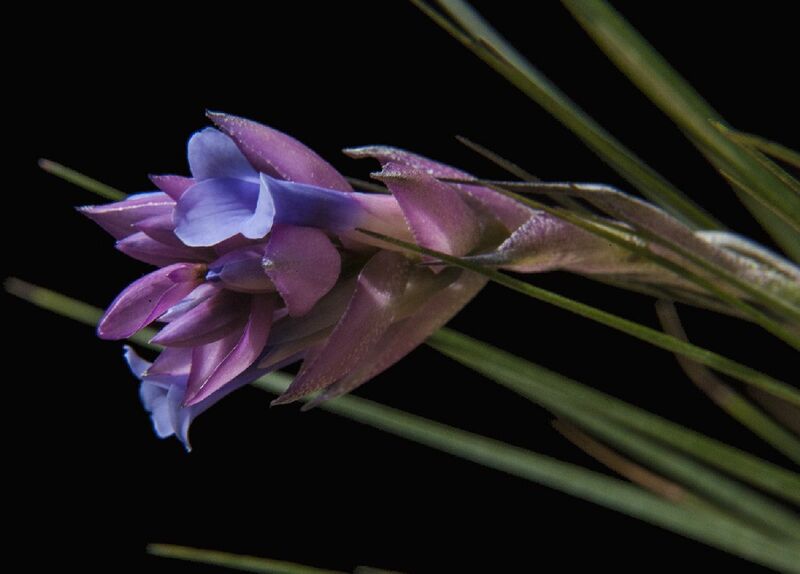 Stamens subincluded, shorter than the style, the filaments linear, contorted near apex; style included. Type Reitz 5910 (holotype HBR, isotype US), Vidal Ramos, Sabia, Santa Catarina, Brazil, 7 Oct 1956. DISTRIBUTION. Epiphytic in forest, 750-800 m alt, southern Brazil. BRAZIL. Santa Catarina. Sabia, Ribeirao do Ouro, Brusque, 26 Dec 1953, Reitz 5826 (HBR, US); Fachinal, Biguacu, 8 Oct 1956, Reitz & Klein 3810 (HBR); Pinhal da Cia., Lauro Mueller, 20 Sep 1958, Reitz & Klein 7189 (HBR, US); Alto Matador, Rio do Sul, 16 Oct 1958, Reitz & Klein 7293 (HBR); Morro Spitzkopf. Blumenau, A. Seidel s n (HBR); Serra da Boa Vista. Sao Jose, 14 Oct 1960, Reitz & Klein 10236 (HBR); Sao Bento do Sul. 12 Oct 1961, L. Seidel 281 (HBR). EPIPHYTIC, caulescent, 0.20-0.30m high. LEAVES 15-20cm long, erect, above the sheath 3mm, in the middle 1.5mm, the upper part weakly filiform, chartaceous, canaliculate-concave, green or dark violet, however never pruinose, sheath 6mm wide, 15mm long, lepidote. INFLORESCENCE simple, polystichous, in general well exceeding the leaves, 5-15-flowered, sublax, 3-4cm long, 2.5-3cm diam. ; scape 8-12cm long, erect, glabrous, almost covered by foliaceous lepidote sheaths that pass over to the bracts; floral bracts ovate lanceolate, apex acute passing to a mucron, sparsely lepidote, up to 20mm long, 7mm wide, rarely inflated, the lower ones exceed the corolla, the upper ones exceeding at least the sepals, veined, rose coloured. 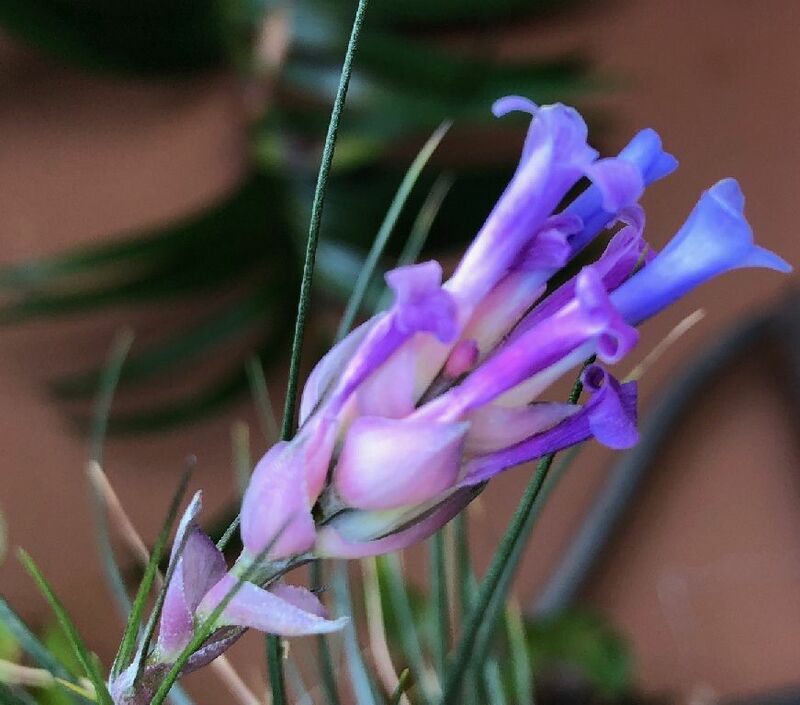 FLOWERS up to 20mm long, erect or suberect, sessile; sepals rose, covering them sinistrorsely, equally connate up to 2-3mm, membranaceous, up to 12mm long, 2mm wide, ovate lanceolate, acute; petals blue, up to 18mm long, initially linear, blade above wider (linear-spatulate), suborbicular blade, lightly plicate, apex obtuse rounded, clearly reflexed; stamens 6mm long, smaller than the petals, subincluded, smaller than the style, few times also larger; filaments linear, connivent, contorted a little above half; Style slightly larger or smaller than the anthers, included. Type - Brasil: Santa Catarina, municipio de Presidente Nereu (ex-Vidal Ramos), Sabia, 750m de altitude, legit R. Reitz 5910 (07.10.1950), HBR holotipo, US isotipo. Common names - Cravo-do-mato, gravatazinho, bromelia. Phenological data - Flowers from September to December. 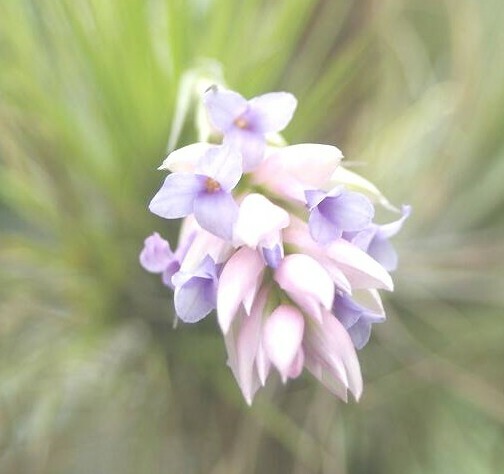 Ecological observations - small Herb, caulescent, 20-30cm high, epiphytic, numerous leaves, disposed in dense rosette, 15-20cm long, erect, very narrow (filiform), papery, canaliculate-concave. green or dark violet, inflorescence in general shorter than the leaves and with few flowers, developed floral bracts, purple-red, petals purple or blue; characteristic and exclusive to the rainforest of the Atlantic coast, situated in the Serra do Mar and over the Serra Geral and their many branches, located between 300 to 1.000 m. high, in vast and impressive numbers, in spite of its restricted dispersion. Especially in diffused light it frequently grows as a heliophyte; it grows preferentially in the branches or trunks of trees in the interior of the less dense forests or located in areas more exposed to light. 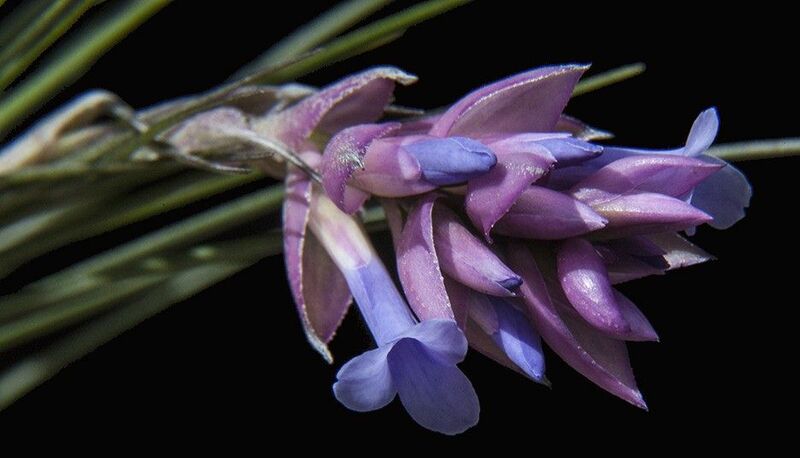 It rarely grows on the eastern border of the plateau, occurring in pine-forests. At the moment it is endemic to Santa Catarina, however, very probably this occurrence area extends to the State of Paraná. Material studied - SANTA CATARINA: ANTONIO CARLOS: Fachinol, flor roxa, R. Reitz & R. M. Klein 3810 (08.10.1956), HBR. BLUMENAU: Morro Spitzkopf, flor, A. Seidel s. nr. (-.09.1960), HBR,. LAURO MULLER: Pinhal da Companhia Barro Branco, eplfito no pinhal, 300 m, flor roxa, R.Reitz & R. M. Klein 7189 (20.09.1958), HBR, US. PRESIDENTE NEREU (ex-VIDAL RAMOS): Sabia, epifito da mata, 750m, flor anil, bracteas roxo-avermelhadas, R. Reitz 5910 (07.10.1956), HBR, typus, isotipo US; ibidem, R. Reitz 5826 (26.12.1963), HBR, US. RANCHO QUEIMADO: Serra da Boa Vista, epifito da mata, 1.000m, flor azul, R. Reitz & R. M. Klein 10236 (14.10.1960), HBR, RIO DO SUL: Alto Matador, flor roxa, R. Reitz & R. M. Klein 7293 (16.10.1958), HBR. SAO BENTO DO SUL: perto da cidade, flor, L. Seidel 291 (12.10.1961), HBR,. Area of dispersal - SANTA CATARINA: Municipalities of Antonio Carlos, Blumenau, Lauro Muller, Rancho Queimado, Rio do Sul, Sao Bento do Sul and Vidal Ramos. BRASIL: At the moment only known from Santa Catarina. Probably in existence in state of Parana. Endemiological note. The leaves arranged in rosettes don't form a reservoir for pluvial waters,which are able to create mosquitoes, transmitters of malaria. 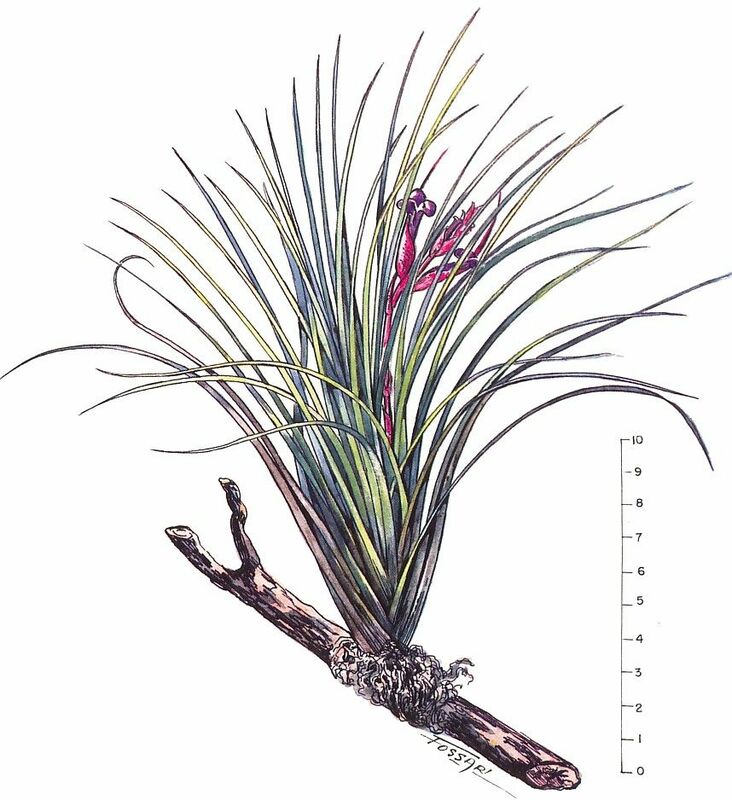 Plant epiphytic, stemless, without inflorescence to 15cm high. Leaves polystichous, erect, almost lying flat against each other, almost rigid, dark green when alive, on both sides dense, appressed, white lepidote, scales very small with entire edges, white, forming transparent cells and much narrower than the dense central area. Leaf sheath pale purple, 10mm long, 7mm wide. Leaf blade very narrow triangular, channelled, gradually decreasing to a very long capilliform tip, 8 – 10cm long, 4mm wide at maximum. Scape erect, green, 10 – 13cm long, naked, 2mm thick. Scape bracts ca 5cm long, elliptical sheath, purple, sheath-like, 20mm long, blade capilliform, 30mm long. Inflorescence simple, polystichous, sub-cylindric, 3 – 5cm long, dark purple, equalling or exceeding the leaves. 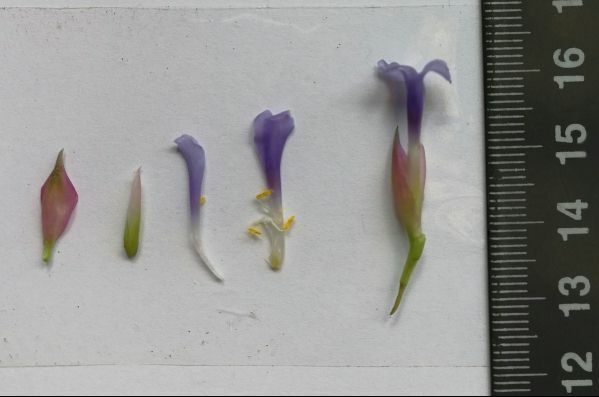 Flower bract membranous, inside naked, outside increased lepidote, bottom ones ovate, with an attenuate tail, without tail 16mm long plus tail about 6mm long, upper ones with an acute tip 14 – 17mm long, 8 –10mm wide. Flower sessile, erect, 15 – 20mm long. Sepals lanceolate, acute, membranous, naked, 10 – 12mm long, equally joined for 3mm. Stamens equalling the flower tube. Filaments complanate, linear, pleated, tip acute, Style cylindric, purple above, 13mm long. Ovary 2 – 3mm long, ovules few, obtuse. 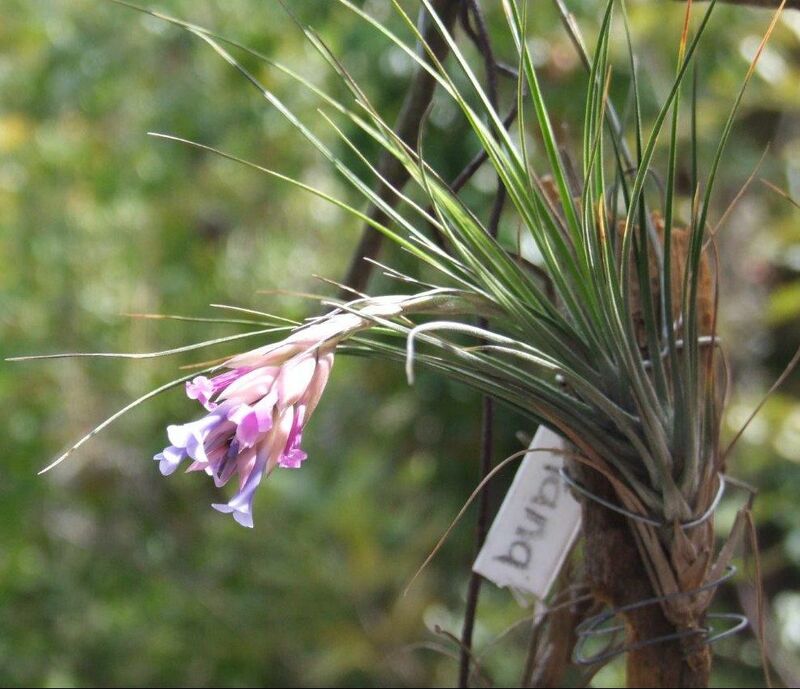 Comment by Pereira - If one considers only the details of the flowers, this new species differs from T. stricta Solan, however the dark purplish inflorescence, the habit of the plant, its quite erect leaves, with capilliform blade, and the shape of the scales made us consider it as a separate species, which we dedicate to Mr. Alvim Seidel who is giving a very good contribution in the discovery of a new species in the Bromeliaceae. 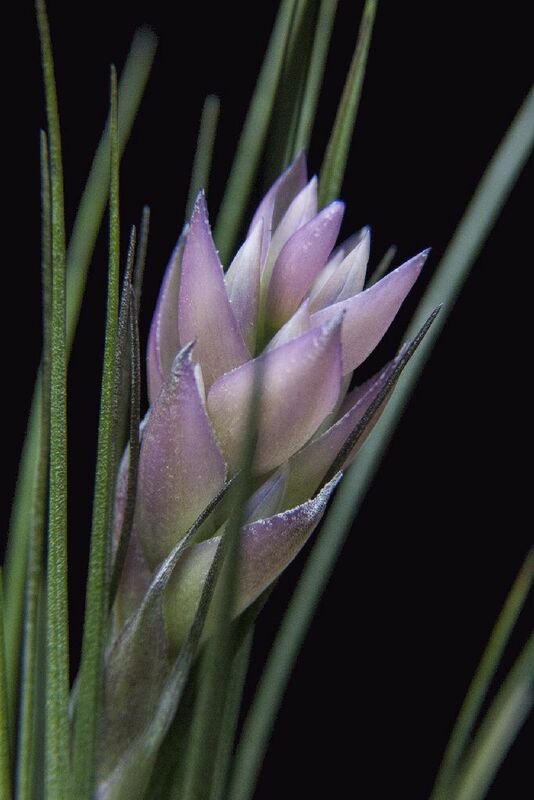 See Reitz’s ‘Bromeliaceas’ 1983 p131-134 where he considers this species as synonymous with his own T. montana!